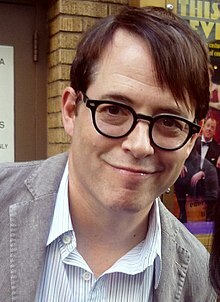 Ta Matthew Broderick (behrt 21 Mart, 1962) ny chloieder fillym as ardan. Ta enney share er er son e phaartyn myr Ferris Bueller 'sy scannane Ferris Bueller's Day Off, Nick 'sy scannane Godzilla, David Lightman 'sy scannane WarGames, Simba 'sy scannane The Lion King, and Hubble 'sy scannane Good Boy!. Ta tooilley coadanyn mychione Matthew Broderick ry-gheddyn ayns Wikimedia Commons. Hie yn duillag shoh er ny reaghey er 19 Averil 2015, ec 11:59.